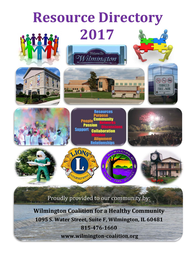 ​Parents who are concerned that a child might be abusing drugs can obtain a free 5-panel drug testing kit at the WCHC office, 1095 South Water Street, Suite F, Wilmington. WCHC staff will provide information and referrals to individuals and families in need of substance use treatment services or other community resources. WCHC volunteers and staff will refer individuals in active addiction to appropriate intervention referral sources, including Braidwood’s C.H.A.N.G.E. program. The coalition publishes full-size and pocket-size community resource directories that are available from the office or online. The WCHC Behavioral Health Advocacy Committee meets regularly to identify gaps in behavioral health services for the Wilmington arear and collaborates to bring new services to the community. The committee also maintains a list of addiction recovery support groups in the area. AMT Counseling offers mental health and substance abuse counseling at the WCHC office location. Coal City, Making Amends, United Methodist Church, 6805 McCardle Road, Saturdays at 6 p.m.
Morris, Primary Purpose, 317 Gould Park Drive, Mondays at 7 p.m.
Braidwood, Second and Fourth Wednesdays, 7 to 8:30 p.m., Old Smokey Building, Braidwood Park District, 245 W. First St.
alcohol, or related behavioral problems. New Lenox, Mondays, 7:30 p.m., St. Jude School, 241 W. 2nd Ave. The entrance is behind the church through Franciscan Hall (see green awning). The sign on the double glass doors will direct you to the meeting.. Contact: 708-466-5963; fa.newlenox@gmail.com. or currently in recovery. Sponsored by the Heroin Epidemic Relief Organization (HERO). PATH aims to increase awareness, encourage prevention, and advocate for self-care.